Decision Science News used to think of Bulgaria as a haven for cheap skiing, but has recently learned that it is the land of magical coincidences. Amazing? Yes. Coincidence? Maybe. Shenanigans? Maybe. Eighteen people bet on the winning numbers the second time around, which is technically a fraction of the Bulgarian population. According to the BBC an investigation is underway. given conservative assumptions, there’s just over a 1% chance of a back-to-back drawings somewhere in the world over a 50-year period. David concludes the Bulgarian lottery result “is not so quite so surprising after all”. But what we have here is the probability of the data given the null (randomness) at 1%. And what do most scientists do when the probability of the data given the null is less than 5%? Given the number of state and national lotteries worldwide and their various win probabilities, how often should we expect a lottery to have identical consecutive winning numbers? This estimate looks a little low – my very rough quick estimate based on 400 lotteries per week was about .15% in one year. I may have messed up the calculation slightly, but including all the multiple draws and regional as well as National lotteries you could easily get higher probabilities. The UK alone has at least 6 National draws per week. 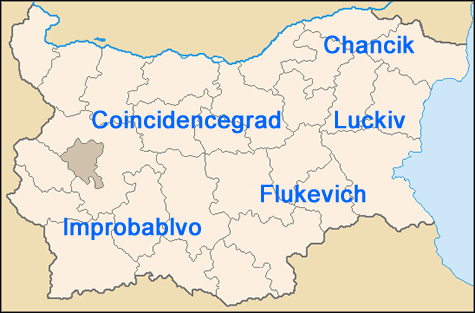 The Bulgarian coincidence was written on October 6, 2009 and filed in Ideas.